Infrasound waves oscillate at frequencies humans can't hear, but they're extremely useful for monitoring nuclear blasts because infrasound decays so slowly within our atmosphere that it can wrap around Earth multiple times. In the late 1990s and early 2000s, researchers discovered that tornadoes and other geophysical events also produce sound within the "near-infrasound" range of 0.5 to 20 Hz. Tornado-producing storms can emit infrasound more than an hour before "tornadogenesis," or tornado formation. This inspired a group of researchers to develop a long-range, passive way of listening in on storms. During the 175th Meeting of the Acoustical Society of America, being held May 7-11, 2018, in Minneapolis, Minnesota, Brian Elbing, assistant professor of mechanical and aerospace engineering at Oklahoma State University, will present his group's work. Elbing and his team have been collecting infrasound measurements from tornadoes to decode information contained in waves about the formation processes and life cycle before potentially devastating storms hit. "By monitoring tornadoes from hundreds of miles away, we'll be able to decrease false alarm rates and possibly even increase warning times," Elbing said. "It also means storm chasers won't need to get so close." 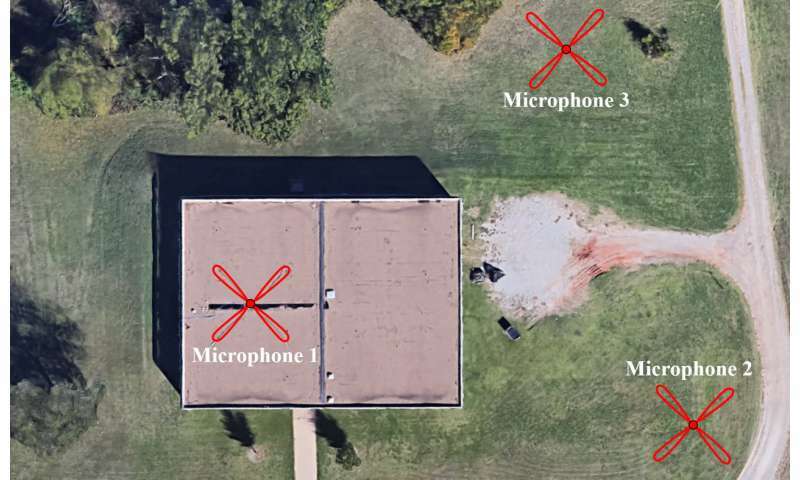 To listen to infrasound in the atmosphere, the researchers use three infrasound microphones at Oklahoma State University arranged in a triangle, each spaced about 200 feet apart. Two key differences distinguish these microphones from the kind we are used to seeing. "First, these are larger for greater sensitivity to lower frequencies," Elbing said. "Second, we need to get rid of wind noise. ... We seal the microphone inside a container with four openings. A soaker hose—just like the ones used in gardens—is attached to each of these openings and stretched out in opposite directions." Elbing and his team then parse out the tornado infrasound from the wind noise. "Wind noise is incoherent, so if you average it over a large space it will sum up to zero," he said. 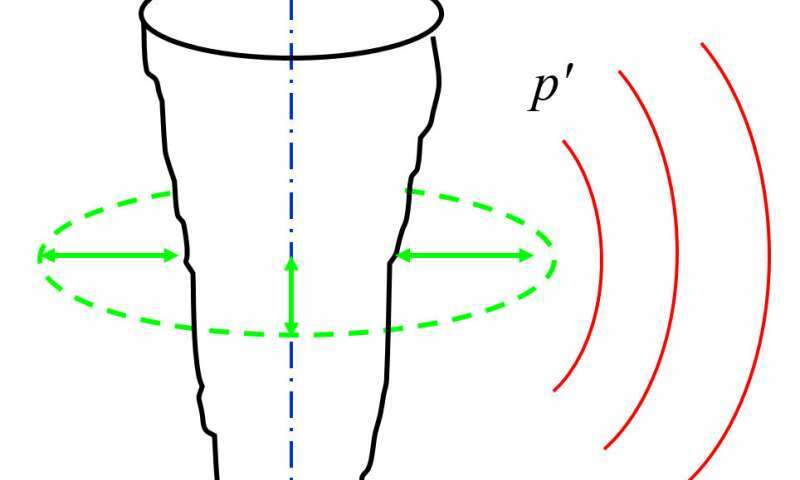 "Conversely, tornado infrasound is coherent—meaning waves look alike—over large distances, so the pressure waves add together and contain information." Determining the fluid mechanism responsible for tornadoes' infrasound can revolutionize how meteorologists monitor and forecast—which could ultimately save lives. "This is especially true for Dixie Alley, which isn't known for the largest tornadoes but frequently has the most fatalities," Elbing said. "Complex terrain, irregular road patterns, and nighttime tornadoes prevent storm chasers from observing these tornadoes, so long-range, passive monitoring for tornadoes will provide invaluable information about their formation processes and life cycle." "Since infrasound is an independent data source, combining it with existing methods should help reduce false alarms," said Elbing. "Today, 75% of tornado warnings are false alarms and tend to be ignored." Now, potentially long lead times—as much as an hour—provided by infrasound could give researchers time to send drones to specific locations to collect critical data before a tornado forms. "This would revolutionize our understanding of the physical processes that produce tornadoes," Elbing said. "Our current research is supported as part of a National Science Foundation multi-university collaboration led by Oklahoma State University (http://www.cloud-map.org), with the goal of developing and implementing drones with sensors for atmospheric monitoring." More information: Presentation 2pPA8 "Monitoring infrasound from a Tornado in Oklahoma," by Brian R. Elbing, is at 3:00 p.m. CDT, May 8, 2018, in room Greenway J at the Hyatt Regency Minneapolis.